LONDON, England -- The Russian Embassy in the United Kingdom tried to pretend Tuesday that Moscow couldn’t have violated the Budapest Memorandum because that agreement only contained one provision: not to attack Ukraine with nuclear weapons. 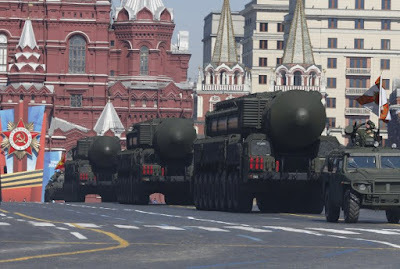 Russian mobile Topol-M missile launching units drive in formation during the Victory Day parade in Moscow's Red Square May 9, 2014. But in fact, as commentators on Twitter noted right away, the Budapest Memorandum contains six provisions, which are plainly visible to anyone who visits the site linked by the Russian Embassy and scrolls down. In other words, the Russian Embassy assumed that it could fool readers into thinking that there was only one provision because the screenshot just showed the first half of the webpage. Twitter users linked to the English translation of the Budapest Memorandum signed in 1994 by Russia, the United Kingdom and the United States. The purpose of the agreement was to reassure Ukraine that if the country gave up its nuclear arsenal, it would retain its territorial integrity. Users lambasted the embassy for trying to pass off painfully obvious falsehoods. “Thanks for demonstrating your lack of intelligence. Just wondering if idiocy was an employment requirement for your position,” one user wrote. While the provision noted by Russian Foreign Minister Sergei Lavrov does exist in the document, it is listed by the Council on Foreign Relations as the fifth point. Lavrov delivered his remarks in response to a question from the UNIAN news agency, which is based in Kiev, Ukraine. Russia is widely held to have repeatedly violated the agreement repeatedly, a point implied by a reporter, who raised the issue of Russian involvement in the conflict in eastern Ukraine and the clear annexation of Crimea. Lavrov lies just like his boss, the dictator Putin. Lavrov is not the first to discover that the more outrageous and surreal the lie, the more likely that it will be believed. Not only Lavrov, but the Kremlin seems to have decided to cast off any moorings to reality and to create a "virtual reality".....much easier to dispose of irksome diplomatic issues in LaLa-rov world.